We’ve found hundreds of exoplanets in the galaxy. But only a few of them have just the right combination of factors to hold life like Earth’s. The weather in your hometown is downright uninhabitable. There’s scorching heatwaves, annual tyhpoonic deluges, and snow deep enough to bury a corn silo. The bad news is planet Earth is the only habitable place we know of in the entire Universe. Also, are the Niburians suffering from Niburian made climate change? Only Niburian Al Gore can answer that question. We as a species are interested in habitability for an assortment of reasons, political, financial, humanitarian and scientific. We want to understand how our own climate is changing. How we’ll live in the climate of the future and what we can do to stem the tide of what our carbon consumption causes. There could be agendas to push for cleaner energy sources, or driving politicians towards climate change denial to maintain nefarious financial gain. We also might need a new lilypad to jump to, assuming we can sort out the travel obstacles. The thing that interests me personally the most is, when can I see an alien? The habitable zone, also known as the “Goldilocks Zone”, is the region around a star where the average temperature on a planet allows for liquid water with which to make porridge. It’s that liquid water that we hunt for not only for our future uses, but as an indicator of where alien life could be in the Universe. Problems outside this range are pretty obvious. Too hot, it’s a perpetual steam bath, or it produces separate piles of hydrogen and oxygen. Then your oxygen combines with carbon to form carbon dioxide, and then hydrogen just buggers off into space. This is what happened with Venus. If the planet’s too cold, then bodies of water are solid skating rinks. There could be pockets of liquid water deep beneath the icy surface, but overall, they’re bad places to live. We’ve got this on Mars and the moons of Jupiter and Saturn. 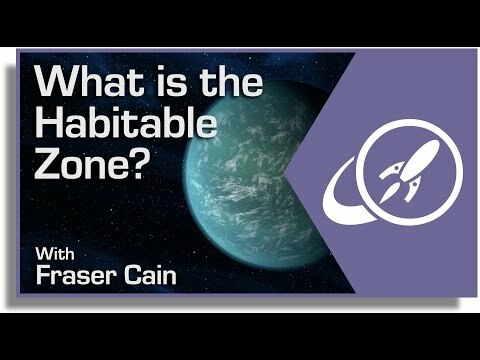 The habitable zone is a rough measurement. It’s a place where liquid water might exist. Unfortunately, it’s not just a simple equation of the distance to the star versus the amount of energy output. The atmosphere of the planet matters a lot. In fact, both Venus and Mars are considered to be within the Solar System’s habitable zone. Venusian atmosphere is so thick with carbon dioxide that it traps energy from the Sun and creates an inhospitable oven of heat that would quickboil any life faster than you can say “pass the garlic butter”. It’s the opposite on Mars. The thin atmosphere won’t trap any heat at all, so the planet is bun-chillingly cold. Upgrade the atmospheres of either planet and you could get worlds which would be perfectly reasonable to live on. Maybe if we could bash them together and we could spill the atmosphere of one onto the other? Tell Blackbolt to ring up Franklin Richards, I have an idea! When we look at other worlds in the Milky Way and wonder if they have life, it’s not enough to just check to see if they’re in the habitable zone. We need to know what shape their atmosphere is in. Astronomers have actually discovered planets located in the habitable zones around other stars, but from what we can tell, they’re probably not places you’d want to live. They’re all orbiting red dwarf stars. It doesn’t sound too bad to live in a red tinted landscape, provided it came with an Angelo Badalamenti soundtrack, red dwarf stars are extremely violent in their youth. They blast out enormous solar flares and coronal mass ejections. These would scour the surface of any planets caught orbiting them close enough for liquid water to be present. There is some hope. After a few hundred million years of high activity, these red dwarf stars settle down and sip away at their fuel reserves of hydrogen for potentially trillions of years. If life can hold on long enough to get through the early stages, it might have a long existence ahead of it. When you’re thinking about a new home among the stars, or trying to seek out new life in the Universe, look for planets in the habitable zone. As we’ve seen, it’s only a rough guideline. You probably want to check out the place first and make sure it’s truly liveable before you commit to a timeshare condo around Gliese 581. Do you think habitable planets are common in the Milky Way? Tell us what your perfect planet environment might be in the comments below. The science team guiding NASA’s Curiosity Mars Science Lab (MSL) rover have demonstrated a new capability that significantly enhances the robots capability to scan her surroundings for signs of life giving water – from a distance. And the rover appears to have found that evidence for water at the Gale Crater landing site is also more widespread than prior indications. The powerful Mastcam cameras peering from the rovers head can now also be used as a mineral-detecting and hydration-detecting tool to search 360 degrees around every spot she explores for the ingredients required for habitability and precursors to life. Researchers announced the new findings today (March 18) at a news briefing at the Lunar and Planetary Science Conference in The Woodlands, Texas. “Some iron-bearing rocks and minerals can be detected and mapped using the Mastcam’s near-infrared filters,” says Prof. Jim Bell, Mastcam co-investigator of Arizona State University, Tempe. Bell explained that scientists used the filter wheels on the Mastcam cameras to run an experiment by taking measurements in different wavelength’s on a rock target called ‘Knorr’ in the Yellowknife Bay area were Curiosity is now exploring. The rover recently drilled into the John Klein outcrop of mudstone that is crisscrossed with bright veins. Researchers found that near-infrared wavelengths on Mastcam can be used as a new analytical technique to detect the presence of some but not all types of hydrated minerals. “Mastcam has some capability to search for hydrated minerals,” said Melissa Rice of the California Institute of Technology, Pasadena. Mastcam thus serves as an early detective for water without having to drive up to every spot of interest, saving precious time and effort. But Mastcam has some limits. “It is not sensitive to the hydrated phyllosilicates found in the drilling sample at John Klein” Rice explained. The key finding of Curiosity thus far is that the fine-grained, sedimentary mudstone rock at the Yellowknife Bay basin possesses a significant amount of phyllosilicate clay minerals; indicating an environment where Martian microbes could once have thrived in the distant past. “We have found a habitable environment which is so benign and supportive of life that probably if this water was around, and you had been on the planet, you would have been able to drink it,” said John Grotzinger, the chief scientist for the Curiosity Mars Science Laboratory mission at the California Institute of Technology in Pasadena, Calif.
Mars’ surface was probably not ever warm and wet long enough to support life, a new study published today in Nature concludes. But underground on the Red Planet might be a different story. By taking a look at several years of data from orbiting spacecraft and examining more than 350 sites on Mars, a team of researchers determined that Martian environments with abundant liquid water on the surface existed only in short episodes. But liquid and likely warm water more likely lasted for longer periods of time below the surface, and this would have been occurring at about the same time that life was developing on Earth. And so, the best place to look for signs of past life on Mars may be underground. The researchers’ findings seem to indicate that Mars’ surface was almost always cold and dry, and any appearances of water – and the salts they left behind – occurred during geologically brief periods. This is certainly not the first time research has suggested brief periods of water flowing on Mars, or that underground water may have persisted, but the news study does help to provide a better picture of the history of water on Mars and even if it could possibly be there today. Clays are crucial to understanding past water on Mars, as they form only when water is around long enough to change the chemical structure of rocks into clay, and different types of clay minerals result from different types of wet conditions. In 2005, clay minerals were discovered in many regions of Mars by the OMEGA spectrometer on the ESA’s Mars Express. 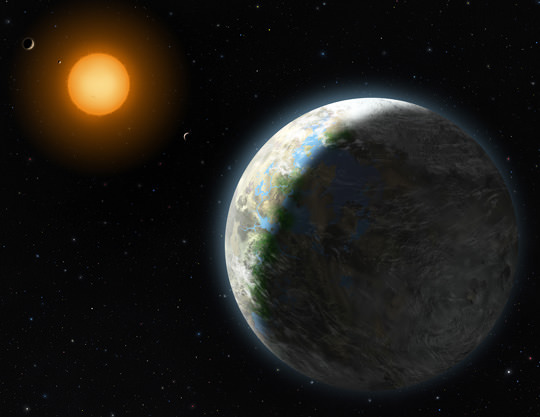 This finding seemed to indicate the planet was once warm and wet. But there’s a problem with Mars’ atmosphere – it is not thick enough now for water to be retained on Mars’ surface, and there is not scientific consensus that it was ever thick enough in the past to have allowed water to remain on the surface. But this new study supports an alternative hypothesis that warm water persisted under Mars surface and many erosional features seen by the orbiting spacecraft were carved during brief periods when liquid water was stable at the surface. During the past five years, researchers used OMEGA and NASA’s Compact Reconnaissance Imaging Spectrometer, or CRISM, instrument on the Mars Reconnaissance Orbiter to identify clay minerals at thousands of locations on Mars. Clay minerals that form with small amounts of water usually retain the same chemical elements as those found in the original volcanic rocks later altered by the water. Two upcoming missions will help decipher the water clues left behind on Mars. The Curiosity rover, or the Mars Science Laboratory will be heading towards Gale Crater, to investigate a large, layered hill that contain clay and sulfate minerals. Curiosity is scheduled to launch later this month. These new findings also have implications for how Mars’ atmosphere may have evolved over time, and the Mars Atmosphere and Volatile Evolution Mission, or MAVEN, in development for a 2013 launch, may provide evidence for or against this new interpretation of the Red Planet’s environmental history. This new study predicts MAVEN findings will beconsistent with the atmosphere not having been thick enough to provide warm, wet surface conditions for a prolonged period.